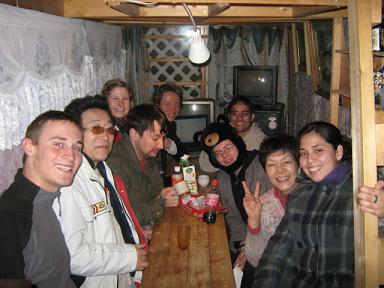 Unique experience in a ordinary Japanese house. Conveniently located to both east (Ueno, Akihabara, Tokyo) and west side(Shinjuku, Shibuya, Harajuku) of Tokyo by JR for 210JPY (bus fare is from 210JPY) to the center of Tokyo. We welcome longterm guest! We are only 8.75 miles away from central Tokyo, to DOWNTOWN tokyo UENO(210yen), SHIBUYA, 20 min (Akabane station platform #5 use shounan line or #7 saikyo line),also 24 hrs another tokyo downtown SHINJYUKU.21min's(JR station to station). yet we are only 3 kilometers away from Akabane, a town in Tokyo full of fun and affordable night life (see Directions section). Also,you get ONE day PASS for JR line at Akabane station. We are a traditional Japanese home with tatami rooms and a cute garden and we welcome all visitors who are interested in experiencing the wonderful culture and warm hospitality of Japan! Those who liked our hostel and decide to stay long term, we will offer you a special benefit! We especially welcome guests who stay longer than 3 nights. 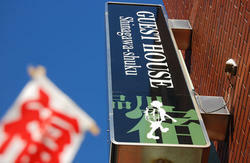 We would like to charge 45JPY extra per night to guests who stay only 2 nights. For guests who stay only 1 night, we will charge 180JPY extra. We promise a secure, comfortable and clean environment for our guests. Our goal is to make Tokyo accessible to everyone - even those on a very tight budget! 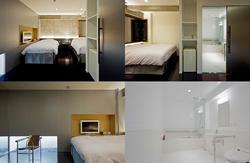 JGH Tokyo is the cheapest accomodation you will find in Tokyo. Our 1 bed Mixed dorm have 'capsule' bed and unlike usual bunk bed, you can have more privacy. We hope that you will understand that this place will support you for longer, more enjoyable stay in beautiful, exciting Tokyo! Our motto is 'Smile, Appreciation and Trust.' We hope that all of our guests have a safe and fun time here in Tokyo. We have dormitory-style rooms,private room and encourage communication with and among our guests. This is a great place to make new friends! You are also welcome to teach us some of your native language. If you have any questions or concerns, please do not hesitate to ask us. Our office hour is 7:00 to 11:00 and 16:30 to 22:00! Please let us know in advance via email if there is change in your arrival time. Cancellation must be notified by phone. *Check out time is until 10:00. We do not accept credit cards and payment must be made in full in cash (Japanese Yen only) upon arrival. Therefore, please make sure that you exchange some currency at the airport. Also, we do not have an age restriction and welcome groups of all shapes and sizes! * During the daytime between 10:30-15:30,'Keihin-Tohoku Line' does NOT stop at Nippori station due to its express service schedule. Instead, please take 'Yamanote Line ' (Green train) at the platform # 11(Toward Ikebukuro) at Nippori and go to Tabata station(2 stops away from Nippori), then take Keihin Tohoku Line to Nishikawaguchi. From Nishikawaguchi, please print out the Map we send after you make reservation. It takes about 6 minutes from west exit. It is also 210 yen from the JR Ueno, Shinjuku, and Ikebukuro Stations on the JR lines. From Ikebukuro and Shinjuku Stations, please take the JR Saikyo line to JR Akabane Station and transfer there to the JR Keihin Tohoku line for JR Nishi-Kawaguchi Station. From JR Ueno Station, Keihin Tohoku line will take you directly to the JR Nishi-Kawaguchi Station. This is the cheapest transportation from central Tokyo. Please take the bus or monorail to get to JR Shinbashi Station. Transfer to the JR Keihin Tohoku line to Nishi-Kawaguchi Station. For directions from Nishi-Kawaguchi Station to our hostel, please refer to the map on our Hostel World web page. The JR Keihin Tohoku line is a direct route that passes through JR Nippori, Ueno, Akihabara and Tokyo Stations. So, it is very convenient to get into the metropolitan Tokyo area from our hostel! We are 14 kilometers away from the center of Tokyo, but it only takes about 15 to 23 minutes by train, most on a direct route. Shinjuku, a town that never sleeps, including the famous Kabuki-cho, is about 20 minutes and only 210 yen away! And, Shibuya Station is only one station away from Shinjuku! For those of you who are skeptical about staying at our hostel since it is a bit outside of central Tokyo, please know that most other accommodations located in the central Tokyo area require transfers onto other private railways or subway/metro lines and actually tend to be more confusing and expensive than convenient! You would need to purchase multiple tickets, walk to stations a distance away, and wait to transfer onto other trains/subways, so it takes more of your time and money. On the other hand, our JR Nishi-Kawaguchi Station is on a direct line for central Tokyo (JR Keihin Tohoku line) that requires no such confusing transfers and waste of money! Akabane Station is 3 minutes away by train (3 km) and is a favorite spot for visitors and locals alike. Akabane has inexpensive restaurants and stores with plenty of places to enjoy Japanese cuisine, such as sushi, yakitori, shabu shabu, okonomiyaki, taiyaki, takoyaki, oshiruko, oden, and more! The Akachochin area has many inexpensive pubs, bars and izakayas perfect for those who want to relax after a long day's journey. Nishi-Kawaguchi Station is also very similar to Akabane and many Japanese locals come here to enjoy a drink and a bite to eat after work. Between Akabane and Nishi-Kawaguchi is the big Arakawa River with golf courses on both sides. Nishi-Nippori and Sugamo Stations have many traditional and famous Japanese temples and shrines, much like Kyoto. It takes less than 20 minutes from our Nishi-Kawaguchi station! Shopping in Ueno and Okachimachi is a few minutes away by train. Japanese locals know that these are the places to go for cheap and well-made goods. Ameyayoko-cho is busy every day as it boasts many retail and wholesale stores perfect for the smart shopper. Next station from Okachimachi is Akihabara, the home of Electric Town. You can find the coolest and most up-to-date electronic goods here! Akihabara also has many Japanese anime stores and the recently popular 'maido-kissa' (or, costume cafes) where the waitresses who serve you are dressed up in cute anime and maid outfits. Also nearby: Shinjuku (Kabuki-cho, Shinjuku Gyo-En Park); Yoyogi (Yoyogi Park, Olympic Stadiums); Harajuku (fashion central!, Meiji and Yasukuni Shrines); Shibuya (Shibuya Center Gai, young people's fashion town); Aoyama (Aoyama-dori, famous for their boutiques and brand-name goods); Sanguu-Bashi (Geihin-Kan, where foreign prime ministers and presidents have stayed); Ebisu (beer gardens and high-class entertainment town, including famous high-rise hotels); Roppongi (as you know, a favorite for foreigners); Azabu-Juban (shopping town); Tokyo Tower (all of the above places are roughly a mile away and walking distance from each other! ); also, Odaiba, Kamakura, Nikko and so much more! We will gladly give directions to any place you may want to go in the Tokyo area! We recommend the Keisei Tokkyu (Keisei Limited Express) Line as it is half the price of other services. Also, there is not too much time difference regarding your arrival in to Tokyo. Please purchase the 1000-yen (about US$8.40) ticket at the airport and take the special express to the Japan Rail (JR) Nippori Station. This should take about 51 minutes, but please note that the last train to leave Narita is at 22:41 p.m. Next, transfer at Nippori to the JR Keihin Tohoku line towards Omiya. Purchase the ticket for 210-yen (about US$1.76) to go to the JR Nishi-Kawaguchi Station.we welcome longterm guest. thank you. station due to its express service schedule. then take Keihin Tohoku Line to Nishikawaguchi. send after you make reservation. It takes about 6 minutes from west exit. It is also 210 yen (about US$1.76) from the JR Ueno, Shinjuku, and Ikebukuro Stations on the JR lines. From Ikebukuro and Shinjuku Stations, please take the JR Saikyo line to JR Akabane Station and transfer there to the JR Keihin Tohoku line for JR Nishi-Kawaguchi Station. From JR Ueno Station, Keihin Tohoku line will take you directly to the JR Nishi-Kawaguchi Station. This is the cheapest transportation from central Tokyo. Please take the bus or monorail to get to JR Shimbashi Station. Transfer to the JR Keihin Tohoku line to Nishi-Kawaguchi Station. The JR Keihin Tohoku line is a direct route that passes through JR Nippori, Ueno, Akihabara and Tokyo Stations. So, it is very convenient to get into the metropolitan Tokyo area from our hostel! We are 14 kilometers away from the center of Tokyo, but it only takes about 15 to 23 minutes by train, most on a direct route. Shinjuku, a town that never sleeps, including the famous Kabuki-cho, is about 20 minutes and only 210 yen (US$1.76) away! And, Shibuya Station is only one station away from Shinjuku!